The UCLA Environmentalists of Color Collective was brought together as a means of challenging the white-dominated conventions of the contemporary environmental justice movement by co-creating a healing space to amplify and prioritize the narratives, experiences, and needs of black, indigenous, and people of color environmentalists. We hope to expand the discourse past race and connect the intersections of class, gender, ability, nationality, and other backgrounds as it relates to environmental justice and sustainability. Our body works toward providing a platform for other marginalized identities within the environmental justice movement by inviting local environmental advocates for speaking engagements, co-creating toolkits for other environmental groups to utilize, and attending/co-sponsoring other events that emphasize inclusion and equity within the environmental justice movement. From these discussions, the UCLA Environmentalists of Color Collective strives to maintain dialogue on the ways in which environmental justice and climate justice intersect our daily lives: as students at a “public” university that becomes increasingly less public and more neoliberal over time; as occupiers of land that once belonged to indigenous tribes whose names we cannot/do not acknowledge; and to shed light on corporate harms that disproportionately impact poor communities and communities of color. 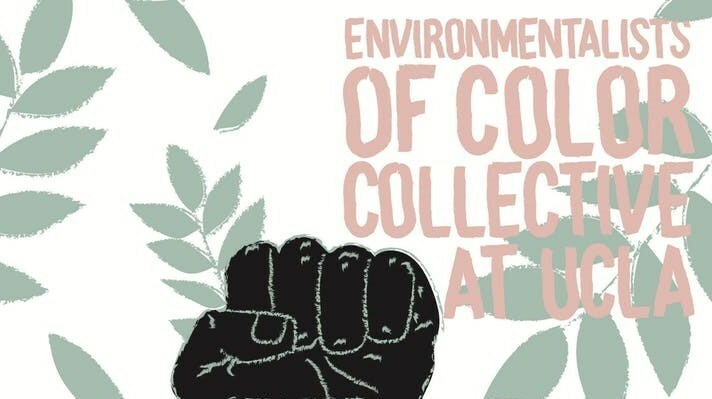 The long-term goal of this collective is to create a permanent space within UCLA that serves its community in vocalizing and undertaking issues of environmental injustices for people of color.